Paddington and Knuckles McGinty in "Paddington 2." The first Paddington movie was nothing short of a gift when it was released in 2015. It was the most pleasant of surprises: a simple, beautiful, open-hearted tale told with endless warmth and intelligence. "Paddington 2" just might even be a slight step up from the original. The film continues the adventures of the sweet, marmalade-loving bear from the darkest jungles of Peru. 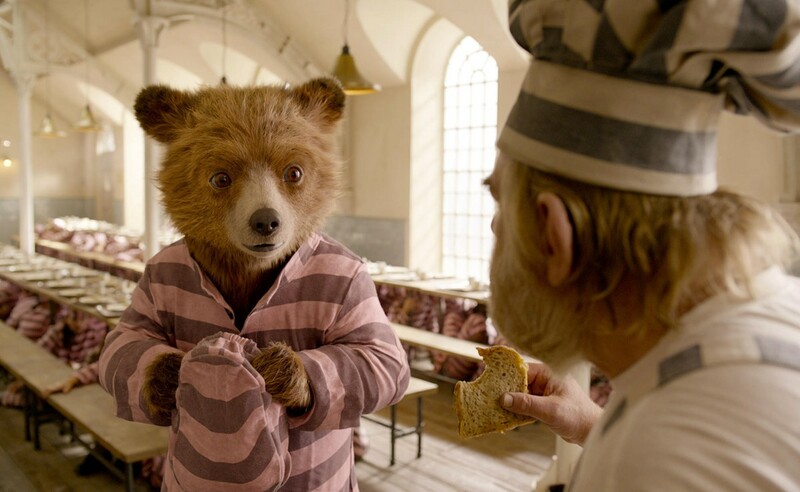 Once again voiced with innate sweetness by Ben Whishaw, Paddington is still living with the Brown family: Mary and Henry (Sally Hawkins and Hugh Bonneville), their two children, (Madeleine Harris and Samuel Joslin), along with their longtime housekeeper, Mrs. Bird (Julie Walters). The bear does his best to live by the words taught to him by his beloved Aunt Lucy: "If we are kind and polite the world will be right." And with Aunt Lucy's 100th birthday fast approaching, Paddington wishes to do something special for her. He finds an antique pop-up book of London, which seems like the perfect present to send back to her in Peru. But when it turns out the book is the key to a long-lost treasure, the bear runs afoul of a greedy, washed up actor by the name of Phoenix Buchanan (a wonderful Hugh Grant). Before Paddington can save up the necessary funds to purchase the book, the odious Buchanan steals the book for himself, and frames the bear for the crime. Paddington winds up in prison, leaving the Browns to try and clear the poor bear's name. But all is not lost, as he bonds unexpectedly with surly prison chef, Knuckles McGinty (Brendan Gleeson). Even behind bars, Paddington can't help but inspire everyone around him to be a little bit better. Like the first film, "Paddington 2" is at its heart an immigrant story. The sequel continues that film's light social subtext, even working in some light anti-Brexit commentary, courtesy of the Brown's xenophobic neighbor (Peter Capaldi). Returning director Paul King (best known for the absurdist British TV series "The Mighty Boosh") brings wit and a gorgeously inventive visual style to the tale. Cheerfully spreading its message of kindness and decency, "Paddington 2" is family entertainment at its best. It's so endlessly delightful, and infused with such joy, that I won't be at all surprised if I'm still talking about the film 10 months from now, when it comes time to name my favorite movies of the year.